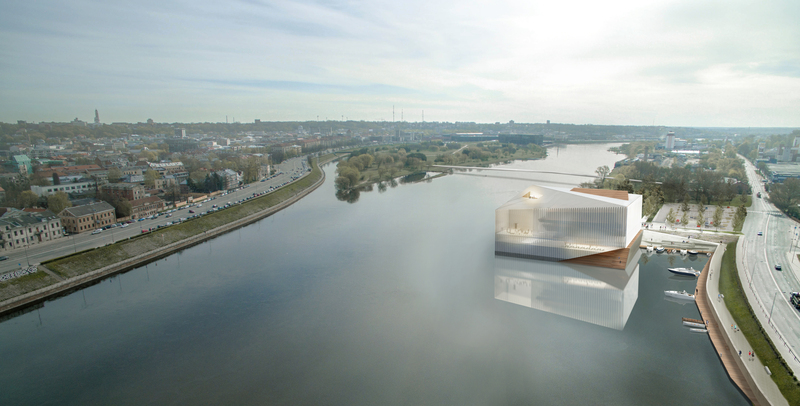 The volume is outstanding due to its exceptional location: it is a building – peninsula, that conceptually belongs to both river banks. 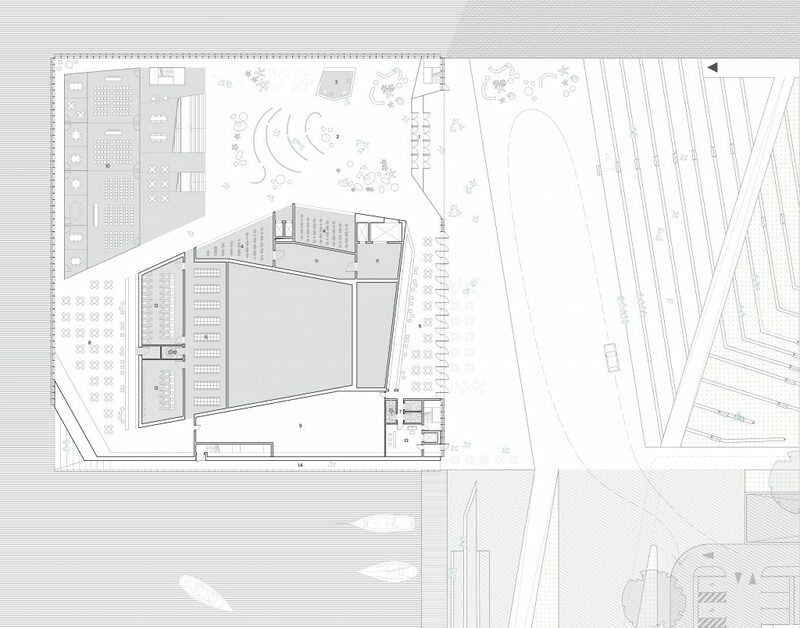 The site and character of the building is conceived as urban and landscape balance for Nemunas island and its Žalgiris Arena. 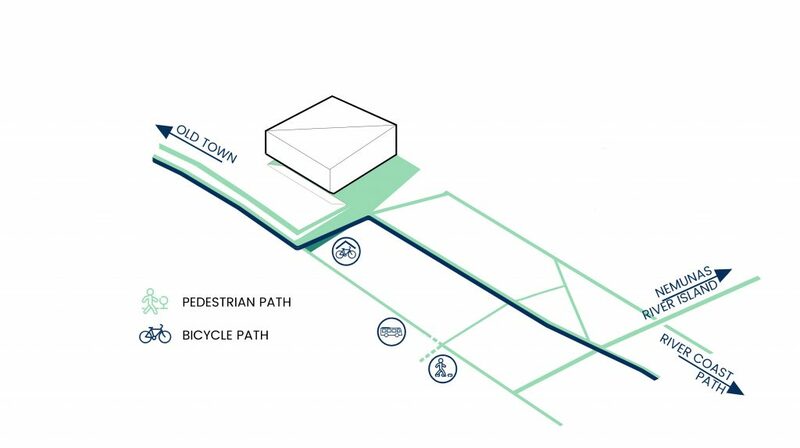 This also enables the approximation of the volume closer to the oldtown and placement of the park closer to the existing and future inhabitants of Aleksotas. 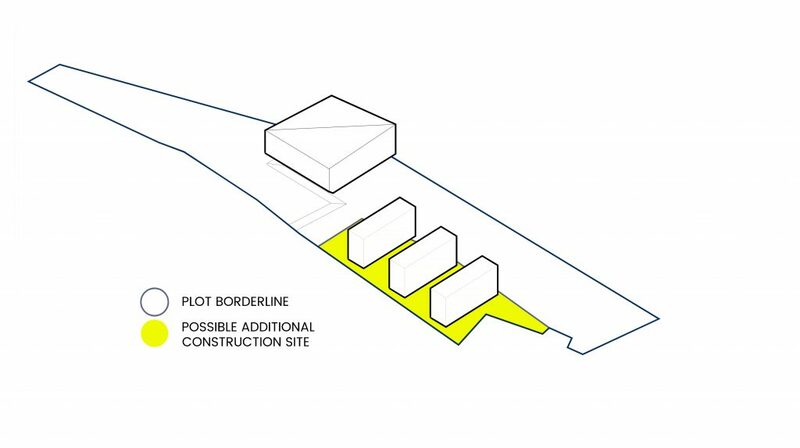 The volume occupies only minimal space on the western edge of the plot and does not exceed the height limits. 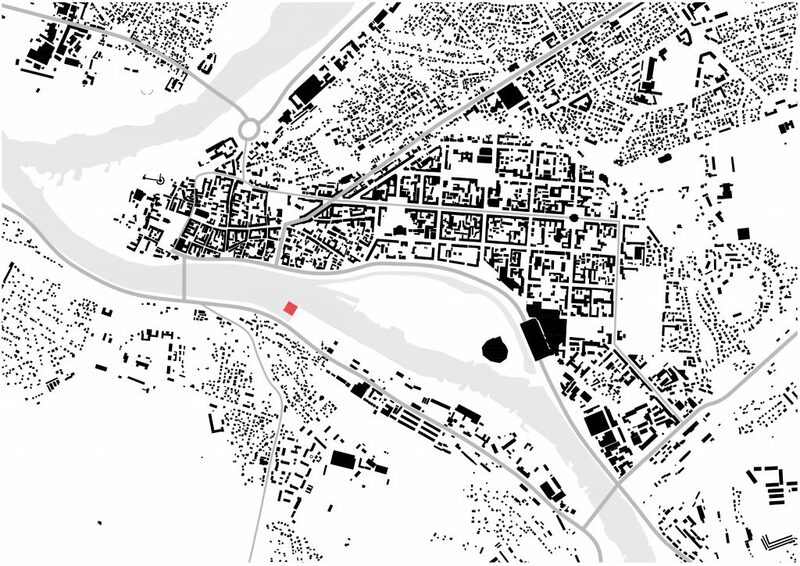 The identity of the left riverside is shaped by the different topographical layers. 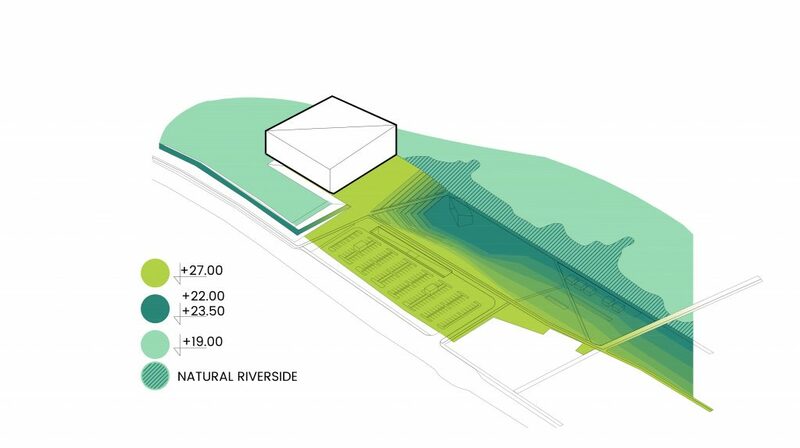 We respect this feature of riverside composition while zoning the plot. A harbour for small ships is a bonus to the required program and improves accessibility of KKC. It also should act as an important impulse for developing the attractivity of the left riverbank. 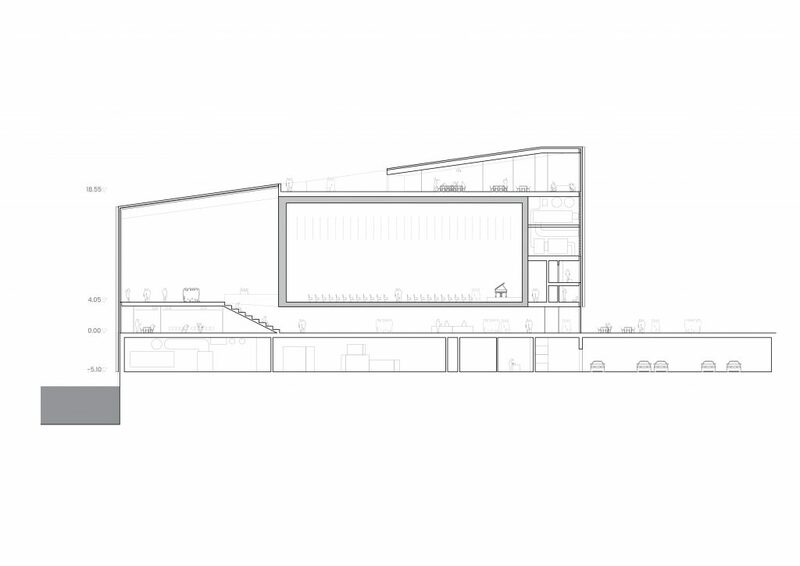 The spatial – volumetric concept. 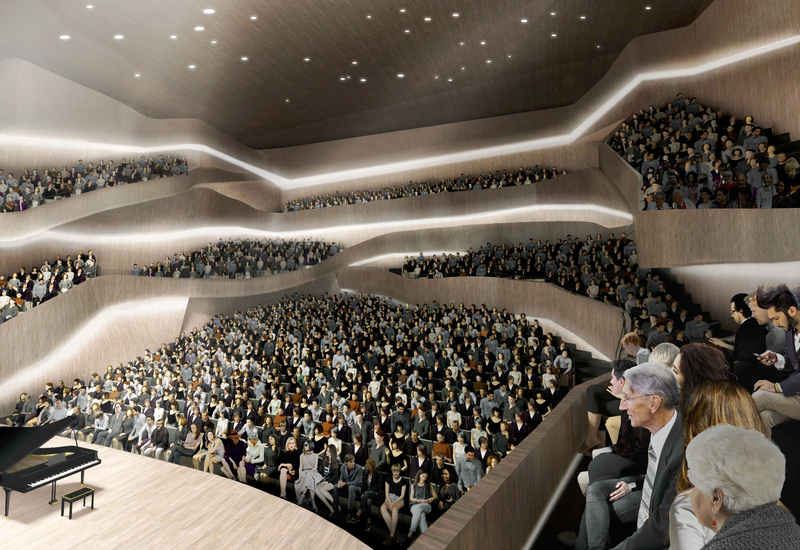 The main concert hall is free-form composed of masses of natural wood. The second hall is hanging next to it above the entrance hall and is more rigid. This couple is enshrouded by the veil of transparent and semi-transparent glass. 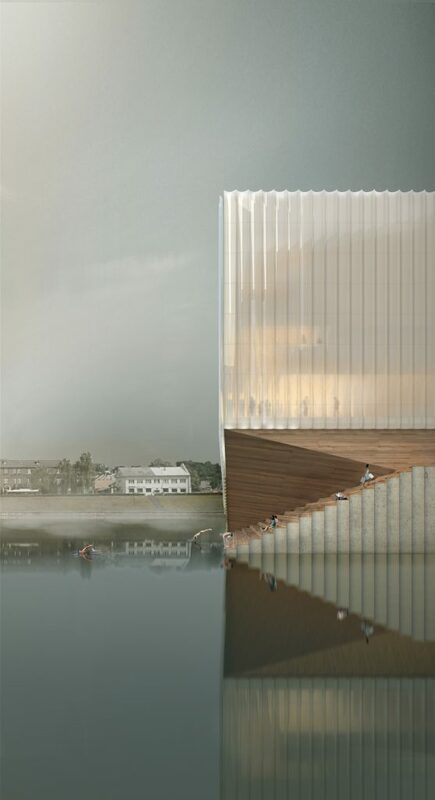 The reflection in the water becomes an important part of the overall expression of the building. 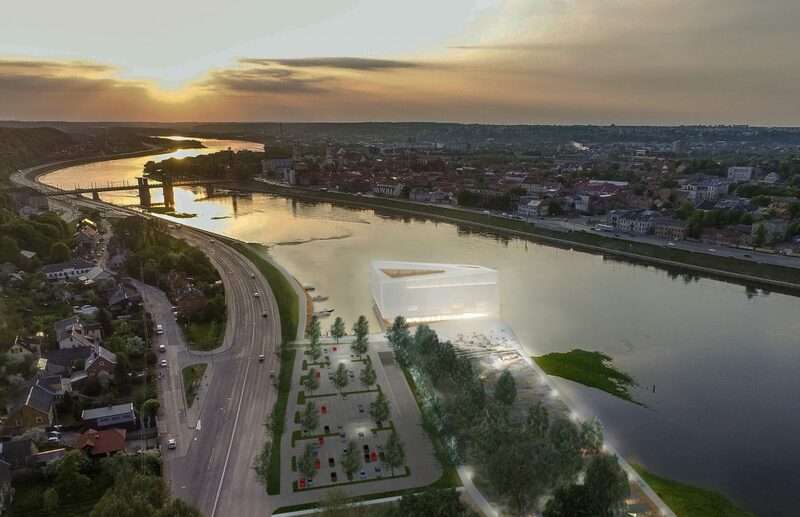 The size and proportion of KKC matches these of the main historical cultural buildings of kaunas: War museum, Musical theater, etc. The facades are parcelled according to the needs of the interior spaces. Transparent, semi transparent and opaque zones are created by playing with two layers. 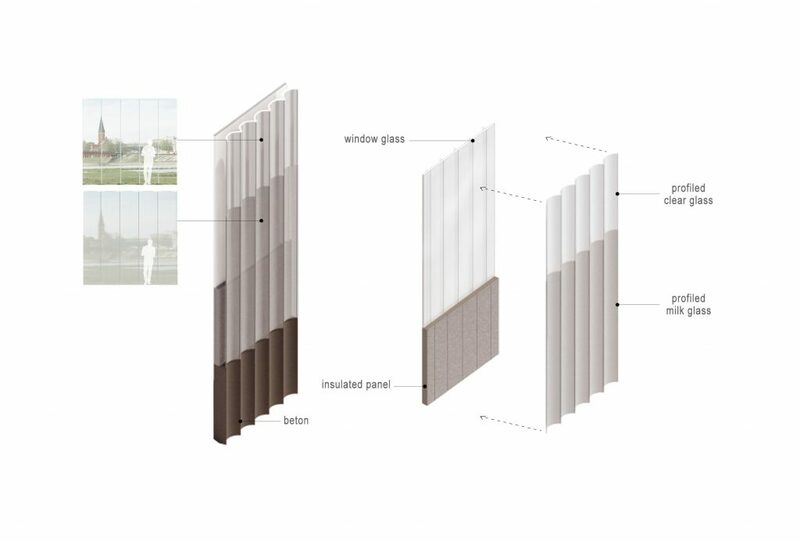 The outside layer consists curved transparent and translucient glass panels while glass curtain wall/windows or insulated wall acts as the inner layer. 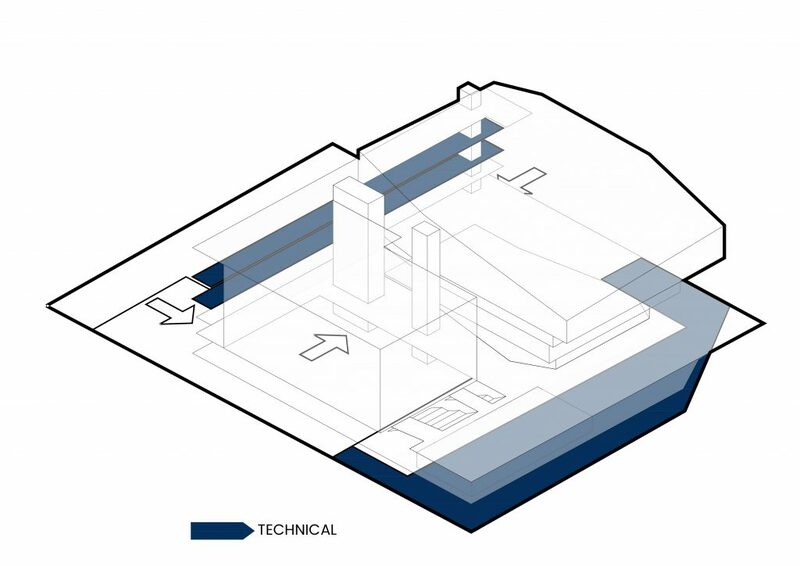 The flooded base of the building and river embankment is made from concrete of the same curved surface texture. The scenario of the building starts as a sequence of changing spatial experiences while moving through the park and square the along the river. 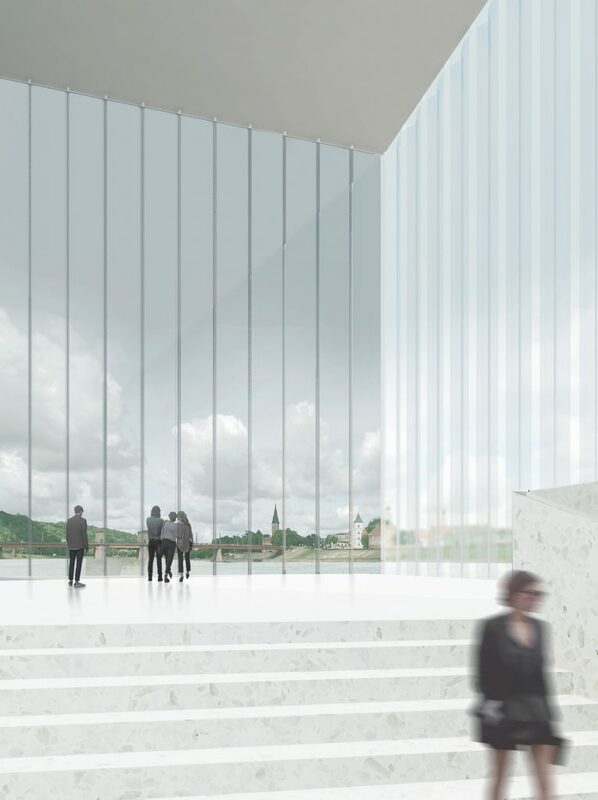 This sequence culliminates as wide and low entrance hall opens up to the light and spatious foyer with the iconic view of Kaunas oldtown. 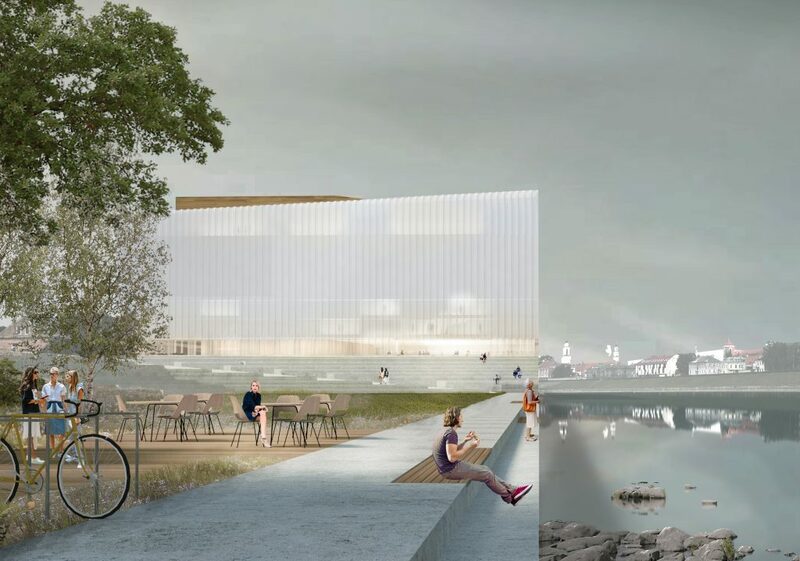 All the views from the public spaces of the building allows for immediete experience of the water: new harbour on the southern side and the flowing waters of the river to the north. The square is facing the water. A visitor experiences the river before he enters the building. The square and the entrance is located on the eastern facade, therefore they are shielded from the dominant western winds. 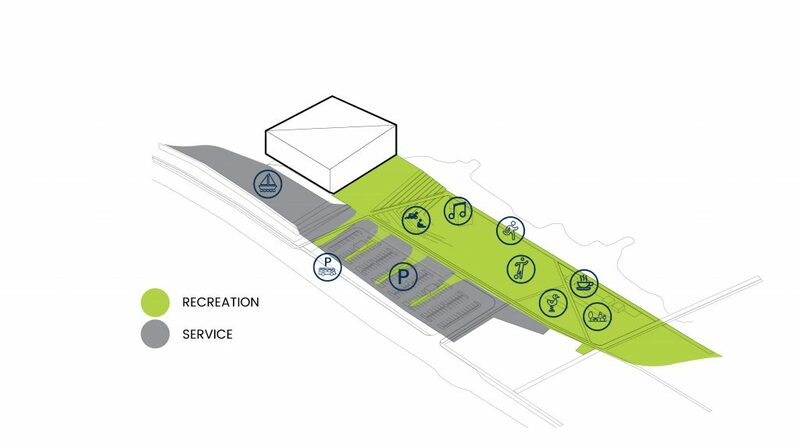 The natural amphitheater connects the square to the park. 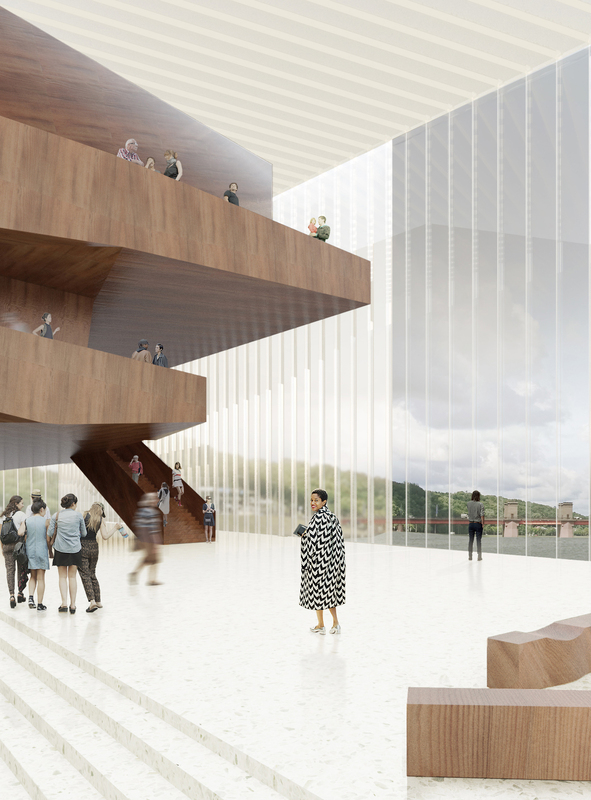 Another important public location is integrated into the building: the wooden stairs at the entrance to the harbour are dedicated for meditation ant bathing. 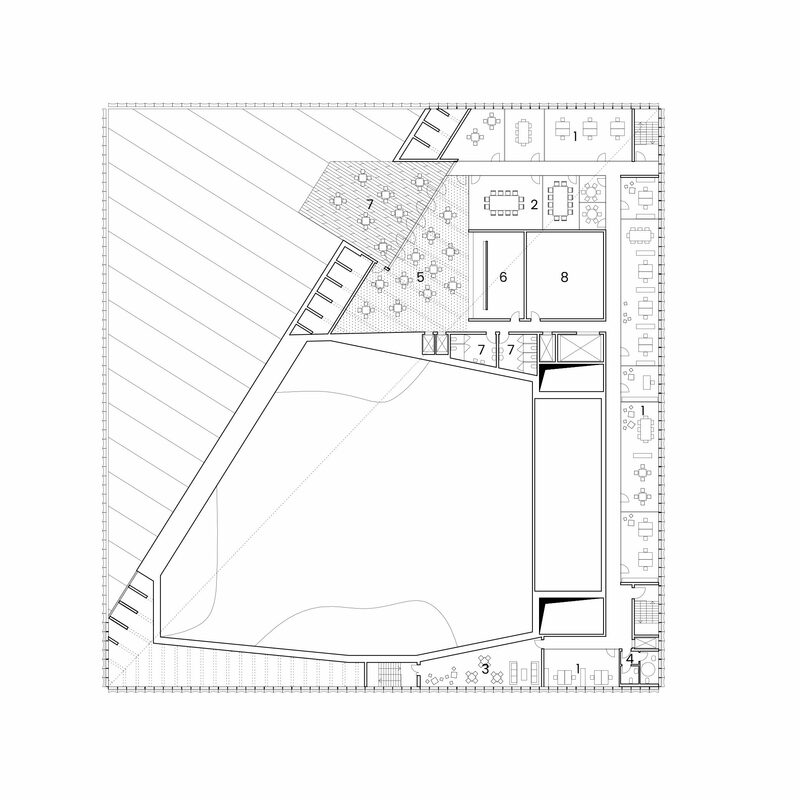 The entrance hall is wide horizontal space, where all the anchor points are well visible. The end of this hall is marked by the stairs leading to the main foyer, where all the entrances to the concert halls are located. The entrance hall and foyer are easily transformed to house multiple funkctions. The reastaurant and conference rooms are located at the end of the entrance hall. They have a possibility to be accessed straight from the outside: from the stairs at the harbour entrance and underground corridor on the northern side. 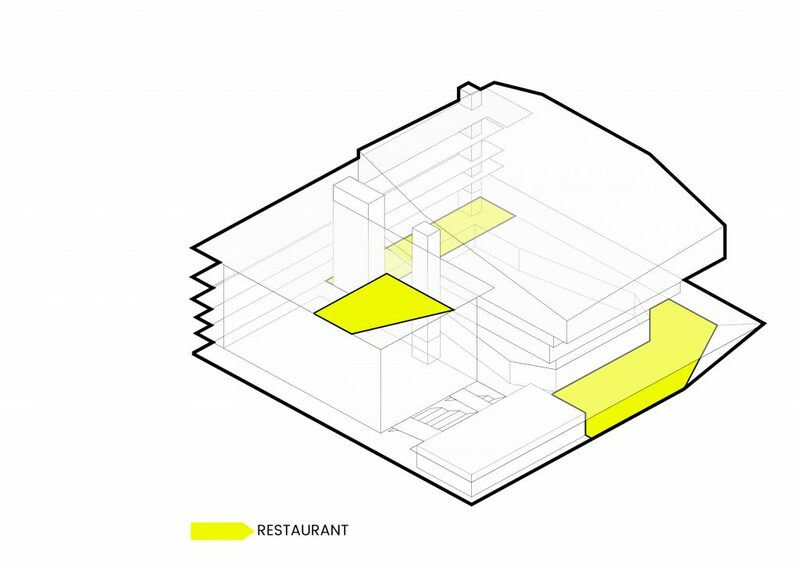 Yet other horeca are located at the entrance (with the direct access to the square) and on the top floor with the access to the roof terrace and view to the oldtown. A space is dedicated in the foyer for the performance break coctail bar. 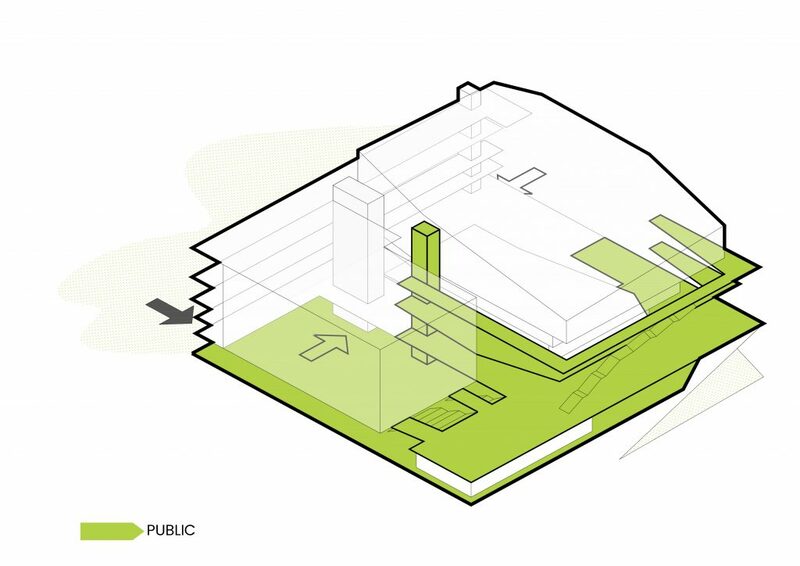 Utility spaces for the building are located underground. 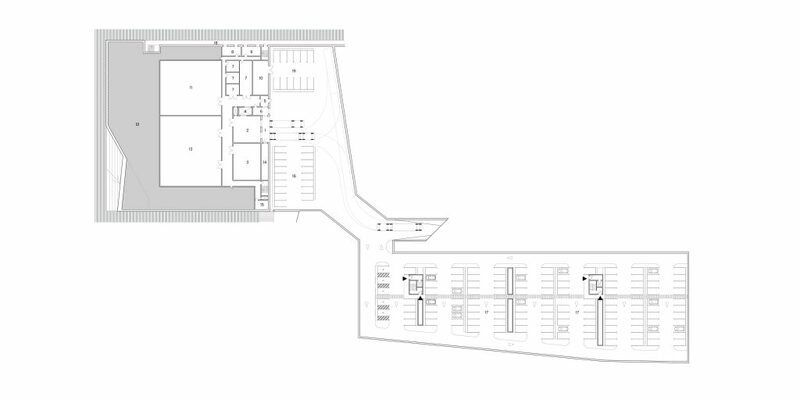 Load bay is accessed by the ramp that acts as access to the underground parking and separates car park from the parking area. Cargo elevater connects utility area and other floors. It arrives to the temporary equipment storage on the groundfloor and backstage on the first floor. Groundfloor restaurant and front cafeteria shares a kitchen area. 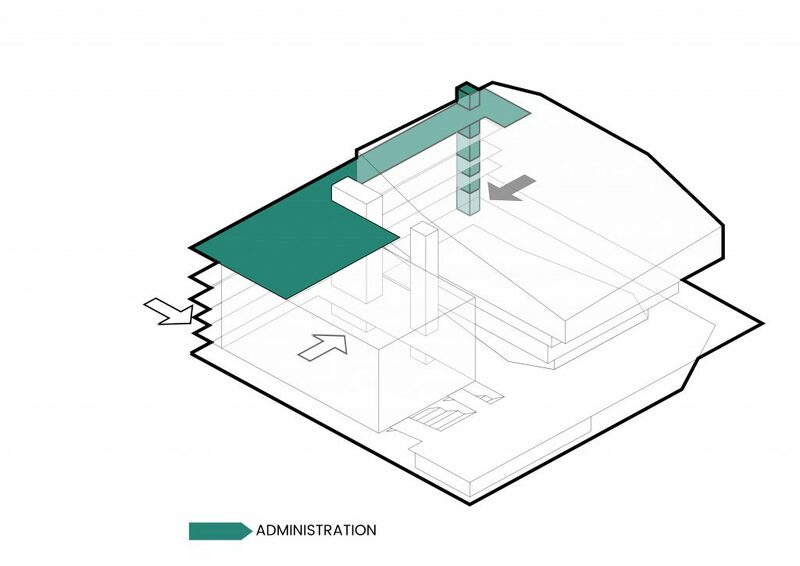 Rooftop cafeteria has a small separate kitchen area and is located next to the meeting rooms of administration that can be also used as separate conference center. 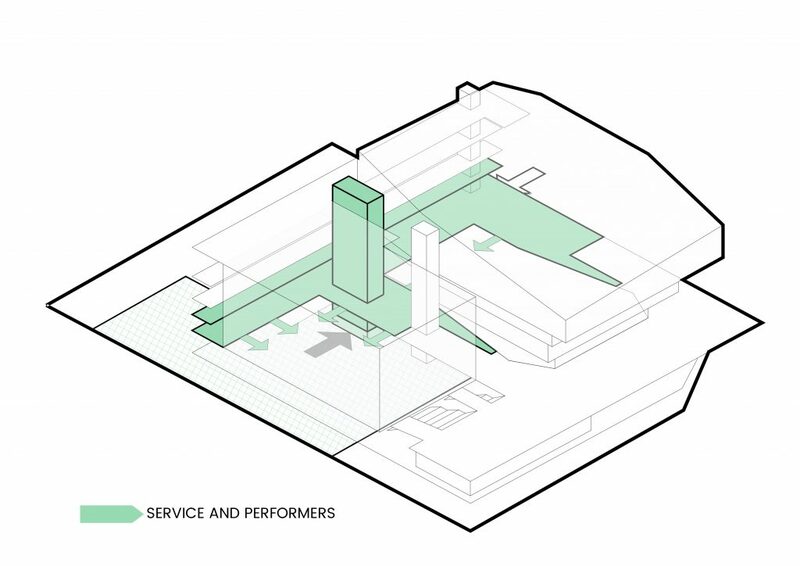 The building has separate audience, utility and adminitstration/performers accesses and interior areas. The main concert hall is primarily dedicated for the acoustics of symphonic orchestra, however deep backstage and transformable stage surfaces allows it to be converted into opera stage with wings and orchestra pit. 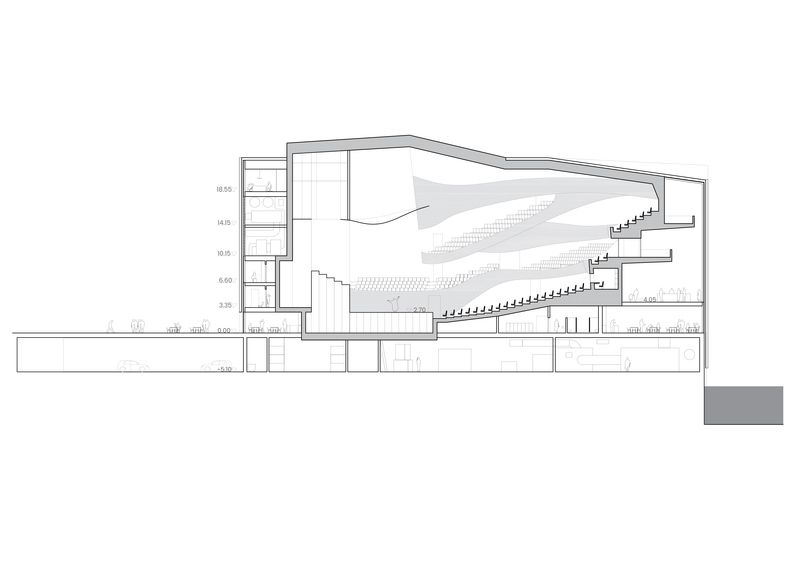 Audience part is designed as a semi-symetric freeform interpretation of vineyard structure. 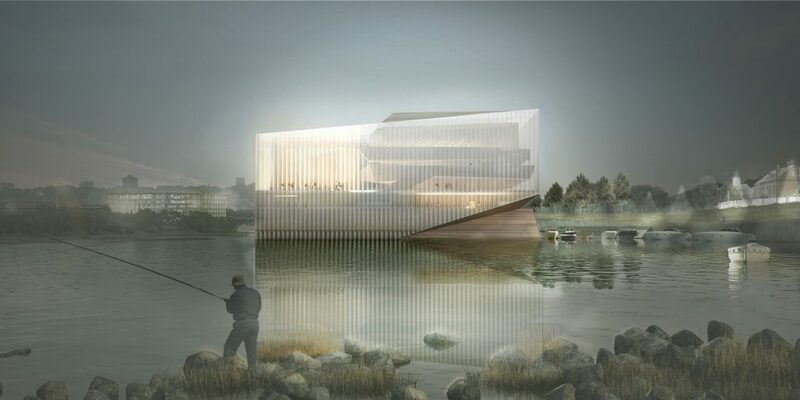 The composition was inspired by the existing swampy edge of the river – an attempt to reincarnate the atmosphere of nature in the sounds of music. A combination of balconies and terraces is balanced for best visibility and sound reception. The surfaces of the balconies allows the improvement of the structure of initial sound reflections and diffusion of sound field. The structure of the hall is concrete shell with the interior cladding of natural wood with the density of over 40-45kg/m2. Number of seats is 1523 and 150 performers. 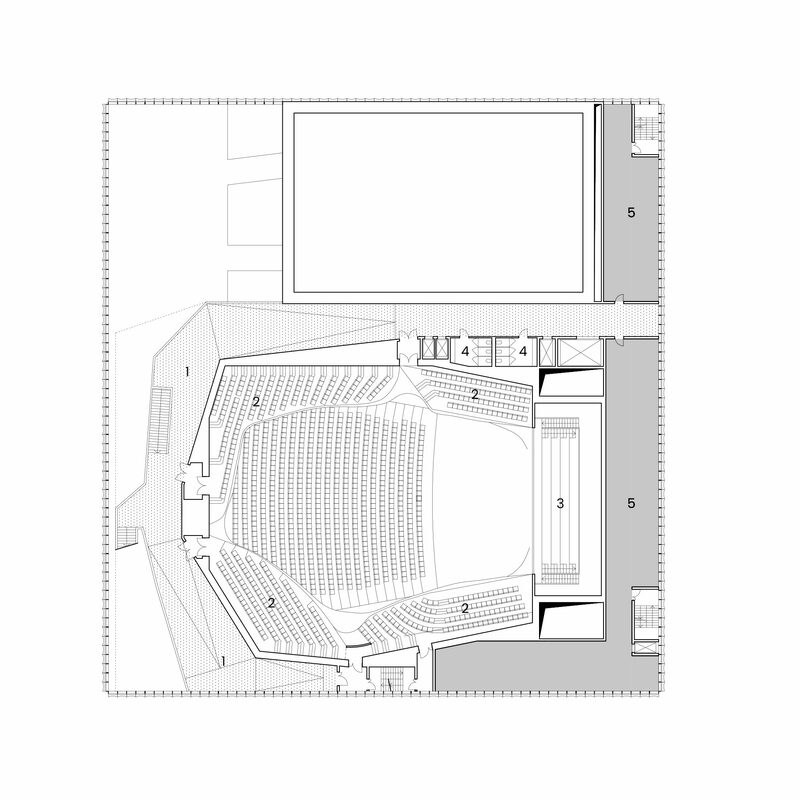 Hall volume is 23703,98 m3. Theoretical volume for one person is 14.36 m3. Projected reverberation time of ≥ 2,00 s with full audience. Projected reverberation time to be achieved with reflective/refractive materials. 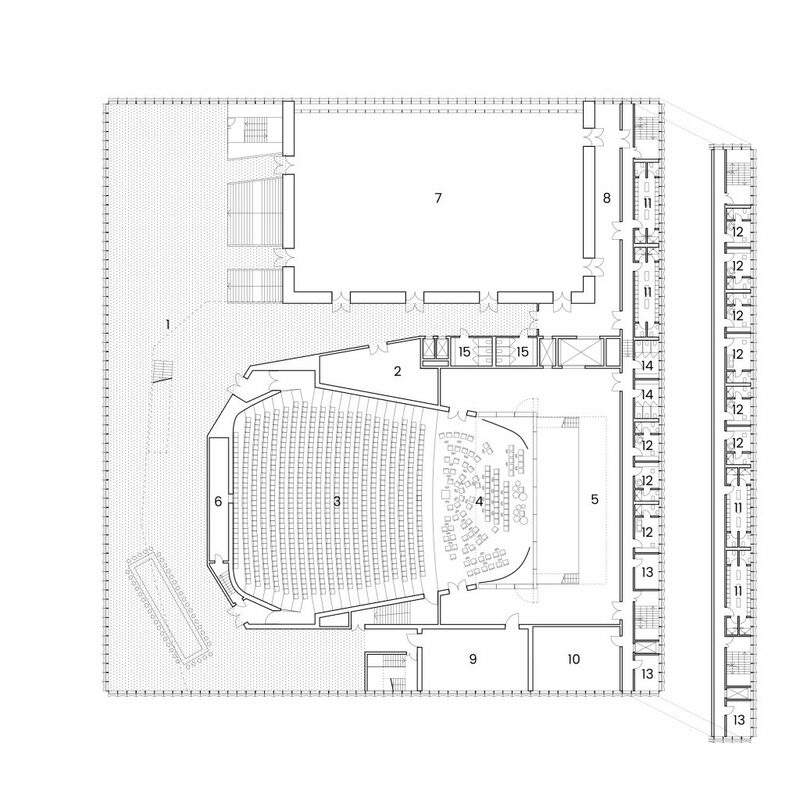 Maximum length of the hall is 40,7m, width 35,9m, height 19,8m. All ceiling and wall elements, that are more than 17m from the sound source are either non-perpendicular or have refractive textures to avoid echoing. 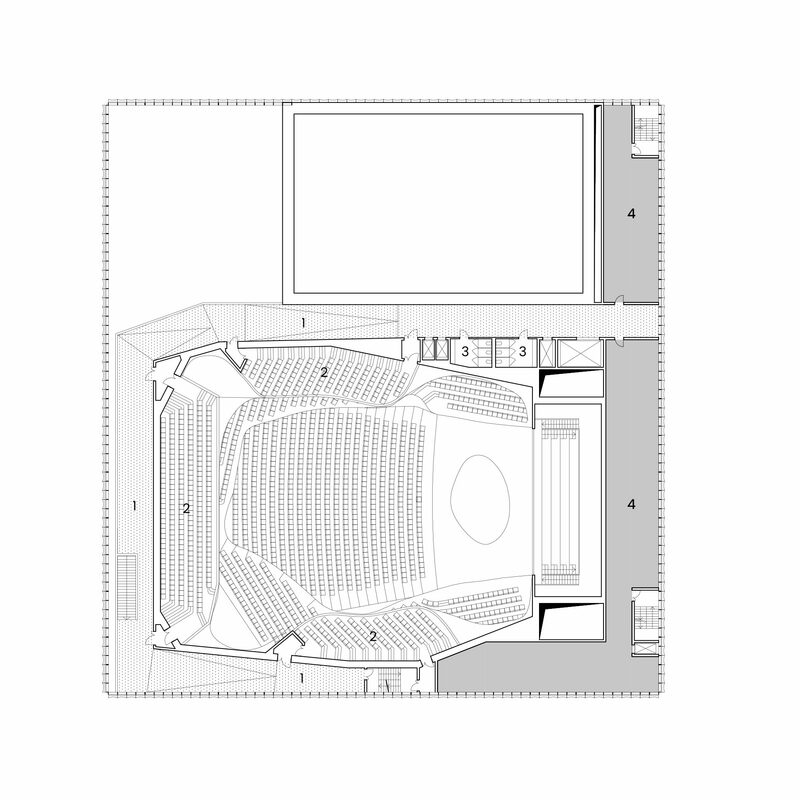 A liftable ceiling reflector (acoustic plafond) is located above the orchestra stage, as ceiling height there is more than 10m.